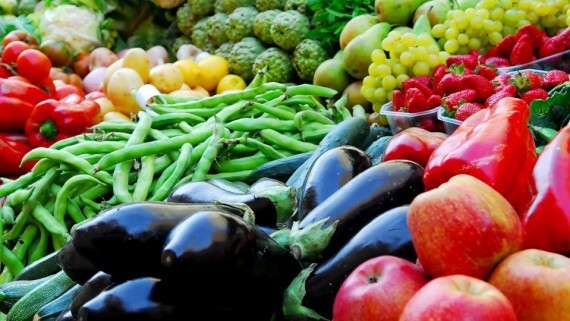 Dieticians acknowledge that a diet that consists mostly of fresh, properly-grown fruits and vegetables, along with a small amount of protein and grains, is a cleansing diet that will provide all necessary ingredients for vigorous growth and metabolism while reducing the risk of colon cancer and other problems that come from diets high in meat, poultry, processed foods, and dairy. Unfortunately, commercial agriculture produces fruit that is devoid of nutritional value and full flavor. Commercial non-organic fruit is grown with poisons, inferior fertilizers and poor quality control methods. The fruit is picked early, often coated with wax or other preservatives, stored and shipped in refrigerated compartments, and then placed roughly in stores. Organically-grown fruit that can be purchased at health stores and sometimes at grocery stores is far better than commercial non-organic fruit, but is very costly, and is thus a luxury for many families. And indeed, store-bought organic fruit is often generic in taste and presentation, lacking the quality of homegrown fruit. More and more people have decided that they will grow their own fruit, for economic reasons, and for reasons of health and convenience. Fruit can be grown outdoors in the ground in many locales, depending on climate and sun exposure. 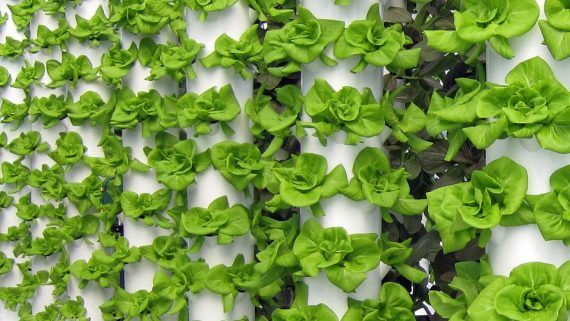 It can also be grown in containers using hydroponic techniques, under artificial lighting, in greenhouses and in other settings. By manipulating crop cycles, lighting, nutrients and other factors, some home growers have managed to supply themselves with a supply of fresh fruit year round at a very low cost. The Advanced Nutrients plant food and supplements company makes the best products for growing your own fruit and vegetables. The company makes formulas that protect fruit trees and other crops. These formulas, such as Scorpion Juice and Barricade, offer systemic protection without the use of poisons. The company also makes formulas, such as Connoisseur, Sensi Pro, Heavy Harvest, OrganicB, Tarantula, Piranha, Voodoo Juice, and other products that will make your fruit trees do much better than if you used regular fertilizers. Please note that agricultural conditions vary depending on your locale; please contact your local agricultural service or a trusted nursery to determine the specific fruit trees that will grow best in your area. Also please note that while it may seem that we are only discussing fruit trees, that there are also fruit shrubs and vines. Where we use the word trees, read it to be understood that we are referring to trees and plants that produce fruits. Probably the first consideration you need to examine regarding growing fruit is what kind of fruit you want to eat. There may well be fruit trees that grow well in your area, but they may not be the kind of fruit you like to eat. Fruit trees can in some cases be useful as ornamental trees, but for economic and practical reasons, it’s best to plant trees that will produce fruit that you and your family will eat. The next step is to determine where on your property you intend to plant the trees. This involves knowing how big the tree is likely to get, and whether its size and/or roots will interfere with power lines, fences, sidewalks, driveways, visual aesthetics, swimming pools, neighbor’s property, other trees, and other infrastructure. This includes an estimate of tree height and width, as well as the spread of roots. Many growers inaccurately estimate these factors, which later causes problems such as cracked driveways, downed powerlines, etc. There are many important environmental factors to consider when you are planting fruit trees. Using evaluative techniques derived from the Permaculture approach to land use and agriculture, you should measure the pH, porosity, drainage, moisture-holding, nutrient value, temperature/humidity, wind conditions, and sunlight exposure of areas where you intend to plant fruit trees. You must also take seasonal variations into account. One important environmental factor crucial to fruit production is called the “chilling hour.” Although it sounds like something from a vampire movie, it is actually a crucial fact about the effects of temperature on the ability of fruit trees to set fruit. For some fruit trees, such as apples, peaches, plums, and pears, an adequate number of hours below 45 degrees F during the tree’s dormant period are required to trigger the development of leaf and flower buds. Each variety of fruit tree has its own specific requirement that has been quantified by researchers. After the adequate number of chilling hours has accrued, the plant will bloom and leaf whenever warm weather occurs. If the chilling hours do not accrue in sufficient quantity, both leaf and fruit production will be severely decreased. Obviously, it is essential that fruit trees you select must be matched with the likely amount of chilling hours that are needed by that type of tree. A complicating factor in this is global warming, which is causing higher winter temperatures in some locales and affecting the number of chilling hours that occur. Calculate the possible effects of global warming on the number of chilling hours in your locale’s winter before you select fruit that is chilling hour sensitive. Also note that some fruit trees and plants cannot tolerate a chill. Take the data you derived from these measurements, and compare them to the needs of fruit trees. You will often find that you would have to make significant if not impractical modifications to a certain site in order to make it ideal for a particular type of fruit tree. You could in that case substitute a tree that is better suited to that site, chose a more appropriate site, modify the site, or otherwise change your planting template. It is important to consider the issue of pollination when considering the planting of fruit trees. In many cases, trees must be within 200 feet of each other and of similar but variable variety so that pollination can take place. Many advisors say that at least three different varieties of a specific fruit should be planted together to ensure consistent pollination; if one tree is lost, the presence of two or more other trees is useful to continue pollination. Some trees are not able to pollinate themselves, so that they require pollen from other trees. This is called cross-pollination, and occurs when pollen from one variety is used to pollinate the flower from a tree of another variety. Bees and other pollinators handle the majority of pollen transfer, but in some cases, wind can also achieve pollination. It is important to know if varieties of fruit that you intend to plant as cross-pollinators, or varieties that are nearby on other people’s properties, are compatible for the purposes of pollination. Citrus, nectarine, tangerine, blackberry, and raspberry are able to pollinate themselves, but plum, apple and pear require cross-pollination from another source. It is interesting to note that figs and persimmons can produce fruit without pollination. In some areas of North America and across the world, pollinators such as bees, wasps and other insects are in short supply due to loss of habitat, and the use of poisons and genetically-modified crops. Inquire of local agricultural experts about the availability of pollinators, and about the spacing requirements, about the varietal aspects of pollination and other factors that ensure your trees will be pollinated. If they are not pollinated, they will not bear fruit. As you are considering which fruit trees to plant, please note that some trees and berry bushes require lots of attention, while others require less attention. With trees like apples, plums, peaches, cherries and others, a considerable amount of expertise, time and inputs are necessary if you intend to receive a good return on your fruit-growing endeavor. It is important to remember that not all fruit-bearing comes from trees; there are a significant number of berries, such as strawberries, blackberries and blueberries that come from plants or vines. We use the term tree interchangeably to refer to all “plants” that produce fruit. Some dwarf varieties of fruit trees and other types of fruit trees and bushes can produce fruit within a year or two after planting, but most will not be productive for several years. Take into account the long-term nature of this enterprise. If you plan to move within a couple of years, you might never see the fruits of your labors. On the other hand, the existence of established, properly-trained fruit trees that will bear fruit in future years may increase real estate values and be seen as a benefit worth money to those considering purchase of your home or land. After you have carefully examined your land, consulted with agricultural experts, and decided what types of fruit you want to grow and where you want to grow it, you are ready to prepare the site for planting. The following instructions are generic, and may have to be modified depending on what you are planting, but are useful instructions for most trees. It is useful to dig a hole that is several times larger and deeper than the root ball of the young tree. The larger the hole the better, providing you have the proper materials to fill the hole with. Successful growers place a large amount of finished compost material in the bottom third of the hole. Then, they import rich soil, matched for the pH and nutrient ratio most appropriate to what is being planted, so that the young tree can be inserted into the hole so that its root ball is properly situated, not deeper than it was planted in its container, and with care not to disturb roots other than to remove any netting or other restraint placed around them. The young tree, its root ball and the entire volume of the hole should be thoroughly watered, but not overwatered. The main purpose of this initial watering is to settle the contents of the hole so that material adapts itself around the planting. Water again in two days, unless rain has fallen. Then, you should apply horticultural products that will provide a variety of benefits to your newly-planted fruit trees or shrubs. These products include Advanced Nutrients No Shock, which helps ease the effects of transplanting from the start-up container into the ground. It should be noted that some growers are cultivating dwarf fruit trees in containers using hydroponic techniques. This eliminates many of the problems, including transplant shock, that can accompany taking a young plant and putting it in the ground. Another product that cushions transplanting shock and pruning shock is called Organic B, which provides B vitamins that are known to cushion transplant shock. Organic B is a good feeder for Tarantula and Voodoo Juice. Tarantula and Voodoo Juice provide beneficial microbes to the root zone. These microbes are often in short supply, even in rich soil mixes. 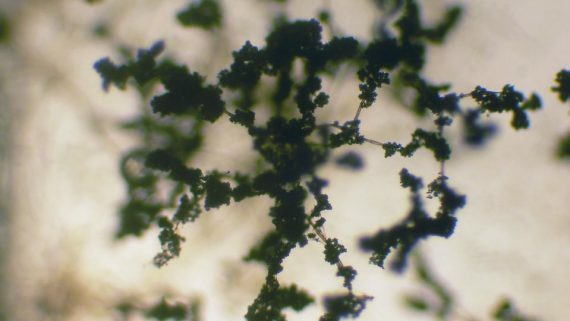 The beneficial microbes create a number of benefits, including protection against harmful microbes that can damage roots. 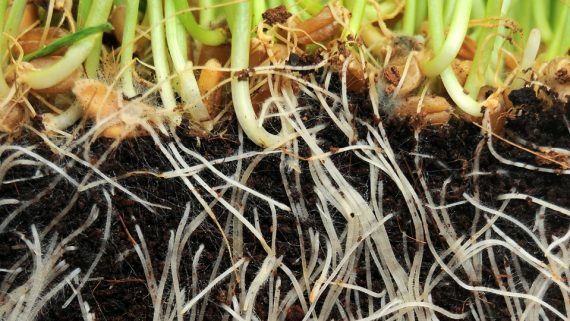 They also form a symbiotic relationship with roots to expand root mass, which furthers the absorption of water and nutrients, thus spurring rapid establishment of the new planting and faster growth. Other products that can be applied during the first two months after initial planting include Seaweed Extract, which provides a variety of helpful substances derived from seaweed, and Barricade, which provides potassium silicate necessary for cell growth and strong internal infrastructure that resist drought, pathogens and insects. Fruit tree yield depends on many of the same factors that other crops depend on, but yield is also very much affected by the way tree branches are trimmed, thinned and maintained. Historically, fruit trees were maintained by pruning, which is the removal of various limbs and/or parts of the trunk. Another method of changing a tree’s structure involves the process of “training” trees into a desired shape and form. It is essential to begin training your trees within the first year after they have been planted. Pruning usually takes place after the first year, because it is harsher for the tree. Training and pruning are done to maintain trees, to tame them to a needed height and girth, and to preserve and increase yield. A primary objective of training and pruning is to develop a strong tree framework that will support fruit production. Trees that are not properly pruned and trained have upright branch angles that can result in branch breakage when there’s a heavy load of fruit. Proper tree training opens the tree canopy to maximize light penetration. Flower buds in deciduous fruit trees develop during the previous summer, and light penetration is essential for bud development and maximal fruit set, flavor, and quality. Although a mature tree may be growing in full sun, if it has a dense canopy may not allow light to reach deep into the tree canopy. Opening the tree canopy also permits adequate air movement through the tree, which promotes rapid drying to minimize disease infection and promotes good aeration that aids transpiration from the leaves. Pruning of young trees establishes the shape of the tree so scaffold limbs will be well distributed up, down, and around the trunk. Limb breakage and trunk splitting later in the trees life can be avoided with proper initial pruning. Pruning stimulates new growth in mature trees, which can increase yield by rejuvenating a mature tree that has begun to decline. Pruning removes diseased, injured, weak, and dead limbs, which are vectors for disease and which waste the tree’s energy and plague its immune system. Inoculate pruned trees with Barricade, Scorpion Juice, No Shock, and small amounts of Revive; these products are made by the Advanced Nutrients company, and will help trees recover from pruning stress as well as increase their resistance to disease. Before making any cuts, take the time to notice the location of the plant to be pruned and consider its future growth. Does growth need to be curtailed, so the plant will not outgrow its space in a few years? Should the bottom growth be raised so a mower can be operated under the lower limbs? Should height be controlled so a ladder is not necessary for harvesting the fruit? How big will the tree be when it is mature? Before you start pruning and training, create a total height and girth image for the tree, and then carry out your machinations to achieve this end. Mature trees are most often trimmed during dormancy, but modern growers believe that it is best to prune during early spring before new growth starts. The time of year when trees are pruned makes a difference in how trees respond to the process. When trees are pruned during fall or winter (dormancy), the trees maintain their energy reserves and do not send out new shoots to replace that which has been pruned. If a portion of the tree is pruned during the winter while the tree is dormant, its energy reserve is unspent. If the tree is pruned during spring, however, the tree produces new shoots that drain its energy reserves and inhibit proper development. There is a good deal of folklore about the timing of pruning. Apple and pecan trees should be pruned first, followed by cherry, peach, and plum trees. A good rule to follow is to prune the latest blooming trees first and the earliest blooming last. Tree age is another factor in dormant pruning. Within a particular fruit type, the oldest trees should be pruned first. Younger trees are more prone to injury from early dormant pruning. Summer pruning takes away a great deal of energy and fruit production, and will result in a decrease in tree growth and fruit yield. Summer pruning begins as soon as buds start to grow, and should be limited to removing the newest growth of the season. Summer pruning should not be done after the end of July, so that the tree does not enter fall and winter with unhealed cuts or wounds. A thinning cut removes an entire shoot. A heading cut removes only the end of a shoot. This type of cut promotes the growth of lower buds and terminal buds below the cut branch. When lateral branches are pruned with a heading cut on young wood, the headed branch becomes much stronger and better able to hold fruit. This type of cut also produces lateral secondary branching. Young trees and branches that have been subject to heading cuts are referred to as “headed.” A bench cut is a pruning cut that takes away vigorous, upright shoots to open up the center of the tree and spread the branches outward. The bench cut is considered a major cut that should only be used for major re-shaping. Improper pruning can greatly damage a tree by leaving a wound that attracts disease or insect attacks. A correct pruning cut should be made flush with the adjacent branch without leaving any stubs. If horizontal cuts are made, they should be slightly angled so that water will not gather the cut surface, allowing the growth of rot and disease organisms. There are sealing tinctures and compounds that can be used as wound dressings, but a prophylactic treatment of Advanced Nutrients Scorpion Juice (which helps trees and plants to prepare for and recover from stress, disease and insects) is advisable before pruning sessions. Pruning is an important tool, but the training of trees is as useful if not more useful than pruning. Training involves the managing of the central trunk of the tree so that lateral branches grow out from it leaving space to move about at the bottom of the tree, as well as space up the central trunk so that light can penetrate and to facilitate picking. Pruning and training of the central leader of the tree (as the central trunk is sometimes called) is best conducted during dormancy. Dormant pruning should eliminate dead, diseased, and damaged wood. Unwanted growth, such as upright growing shoots and laterals with sharp branch angles not removed during summer pruning, should be removed at this time. Unbranched lateral branches should be headed by approximately 1/4 of their length to encourage side branches and stiffen lateral branches. Apple and pear trees are usually trained to a central leading trunk. The trees are pruned to foster a main trunk with horizontal limbs every one to two feet up the leading trunk. A pine tree naturally forms into a central leader type of tree. The pine tree grows into a graceful central leader naturally, but fruit trees must be trained to look like this- it won’t happen naturally. Wooden “spreaders” are often used to widen angles between the limbs and trunk. An “open center” style is the preferred method of pruning peach trees. Select three to four main scaffold branches beginning 30 inches above the ground. Care should be taken to select strong, vigorously growing branches. Picture an inverted umbrella when selecting the scaffold branches. Avoid narrow crotches (less than 60 degrees) as later these will be prone to splitting when the limbs are loaded with peaches. Maintain an open center, but not bare center, to allow sunlight and air movement. Pruning of mature trees should consist of heading back branches to maintain shape and topping to maintain height, removing excess branches, and removing diseased/injured/dead wood. Peach trees bear on 1-year-old wood, and pruning is necessary to assure an annual supply of fruiting wood. Plums require minimum pruning. Prune mature trees to get rid of excessive branching that blocks light. Prune tall branches to limit the height of the tree. Figs require minimum pruning. Prune to maintain size and to remove damaged wood. If desired, figs can be pruned to single trunk for tree form or multiple trunks for a bush form. In the South, the most prevalent shape is the bush form. Blueberries require minimum pruning. Prune low branches to raise fruit off ground and to facilitate mowing under plants. Remove excessive and weak branches. Head back tall shoots on mature plants to keep size to desired level. Muscadines and grapes must be trellised. Trellis supports the vines and fruit; they also maximize sunlight penetration. Many forms of trellis can be used. At planting, select the strongest vine and train to the top of the trellis. Cut off the growing tip and allow lateral branches to grow. Select four lateral “arms” to follow the trellis wires. Maintain the four lateral arms and remove any additional vines that may grow from the central vertical vine. Once the lateral arms have reached the desired length of approximately 5 feet, tip the growing point to stop elongation and to stimulate fruiting laterals to develop. Fruit is produced on year old fruiting spurs. When the vine is dormant (usually in December or January), prune the fruiting canes to 3-4 buds for grapes and 8-10 buds for muscadines. If vines are not vigorous, reduce the number of buds according to plant vigor. Blackberries are susceptible to several types of diseases, especially in wet climates in fall. Pruning canes to one foot above the ground immediately after fruiting season and removing the canes from the field reduces the occurrence of the disease. Blackberries bear on wood that is two years old or older. Fruiting wood is produced on the growth that occurs after pruning in the fall but before the coldest part of winter sets in, so fertilize with a high nitrogen fertilizer and give good amounts of water after pruning to promote rapid growth for the next year’s crop. Mature trees that have been properly trained and pruned will require minimal pruning. It is essential to prevent excessive shading that can occur when the top of a tree has too many branches. The ideal is to have a fruit tree that has a Christmas tree shape, which allows light to fall on the tree and into the depths of the tree at maximal levels. Another type of pruning has nothing to do with branches; it is the removal of fruit early in the fruiting cycle from trees that have begun producing fruit (most trees begin to produce fruit within three years of planting). Younger trees especially cannot always support all the fruit that begins growing on them. In the case of apples, peaches, oranges and similar fruits, it is useful to remove some fruit so there is approximately four inches or more between each. For fruit that grows in clusters, such as cherries, this formula is less applicable. Watering and feeding are two major growth factors under the control of the grower, even though rainfall patterns have influence over watering in some locales. If you have properly prepared the root zone before planting, a large area around the roots contains a mixture of compost and well-aerated rich soil which are ideal for holding water. In arid regions or regions where water is in otherwise short supply, when preparing the ground for planting, it is useful to put in water-holding crystals. However, do not do this in areas where there are periods of heavy rain, because the water-holding crystals can make the root zone too boggy, which causes problems for the roots by causing root rot or preventing penetration of surface oxygen deep into the root zone. It is better to give the root zone a thorough soaking once a week than to do several shallow waterings. By pouring large amounts of water deep into the root zone, trees and plants are encouraged to send their roots deep into the ground. Deep roots are better for anchoring the tree and drought resistance. Light watering promotes shallow root growth in the top few inches of the soil causing the soil and roots to dry out faster, hence more frequent waterings are needed, and these waterings waste labor and do not promote deep root growth. The most watering should be done during spring, summer and early fall, as heat and humidity dictates, with less water applied as the plant loses its leaves and begins to go dormant. The use of Tarantula, Piranha, and Voodoo Juice on a regular basis can be useful as an adjunct to water, especially during the first two years after planting, to promote beneficial microbes in the soil, increased water absorption, and faster root growth. After the tree or shrub has established itself in the ground for approximately two months, you can begin a feed program as appropriate to the type of fruit you’ve planted and the season. There are many debates about what time of year is the best for planting fruit trees and shrubs, with some suggesting that anytime between late fall and spring is appropriate, but this author prefers planting in spring and early summer, preferably in early spring. The early feed program should be mild, with a higher ratio of nitrogen than other nutrients. As your fruit trees grow and mature, especially when they are mature enough to set fruit, there will be different feeding protocols. Feeding fruit trees is a complicated matter, in part dependent on the type of tree, its age, and the season. Companies like Advanced Nutrients have identified a necessity for providing different ratios of nutrients during spring, summer, and fall. 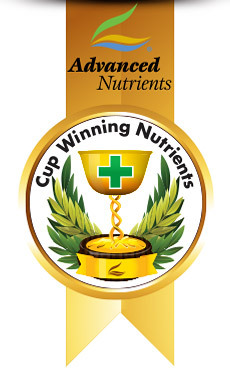 They’ve made a product called Heavy Harvest which provides three separate nutrient formulas that change as the year progresses. The use of three formulas is necessary because trees need different nutrients during different times of the year. Before plants are mature enough to set fruit, there is little need for the second and third phases of formula provided by Advanced Nutrients, which are summer and autumn formulas that contain ingredients specially designed to promote blooming and fruiting. It is important not to overfertilize young trees. They do not have fully developed root systems so it is hard from them to absorb lots of nutrients. Overfertilization discourages trees from putting down deep roots searching for nutrients in soil. Overfertilization with high nitrogen fertilizers can cause excessive vegetative growth, which means more pruning, and can direct the tree’s energies to branching and leafing rather than to main trunk growth and stable infrastructure upon which bountiful fruit yield might later be supported. After trees are mature enough to set fruit, Several Advanced Nutrients formulas provide ideal nutrition. One of them is the outdoor Heavy Harvest autumn formula, designed to support flowering and fruiting growth. This is a solid approach to increasing fruit yield, taste and quality, because the Advanced Nutrients company has created far more advanced means of augmenting fruit growth and quality. One of their products is called Sweet Leaf, which contains special ingredients that increase the growth rate, size and taste of fruit. Another useful product is Carbo Load, which supports growth during fruiting. It is important to use fertilizers from progressive companies such as Advanced, because most fertilizers contain inferior components that can damage your trees and degrade the taste and yield of your fruit. In an ideal situation, trees would be fertilized with totally organic ingredients, and many of the products made by companies such as Advanced are totally organic, but a combination of high quality synthetic and organic ingredients have been found to be a workable compromise in most settings. How do you protect fruit trees and fruit from pests, pathogens and diseases? Regardless of what the commercial fruit industry says, the use of toxic poisons on fruit creates an unacceptable and undeniable risk to consumers and the environment. In many cases, poisons are sprayed directly on the fruit and penetrate into the fruit. Chemical companies have paid for fancy studies that claim that properly applied poisons have predictable residue rates that are safe for consumers, but these studies and their optimistic conclusions can best be understood in the same way that optimistic clinical studies claiming that Vioxx was harmless were produced by Merck, its manufacturer. It is true that organic and holistic protections for trees and fruit are more labor intensive and in some locales less effective at preventing disease and pests than chemical methods. 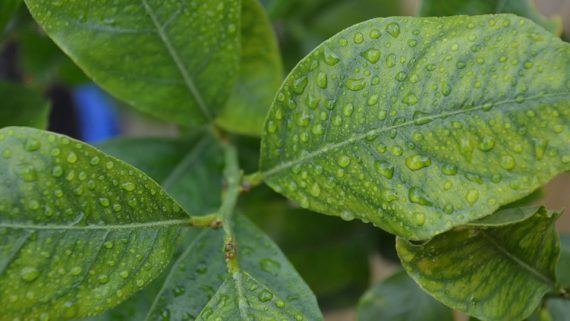 High humidity, moderate temperatures and an abundance of insect life in some areas of North America make it harder to defeat molds, fungi and insects in those locales when compared to fruit crops grown in the arid West or in the North. Yet, there are many successful 100% organic orchards operating commercially, and this proves that organic and holistic methods for controlling fruit pests and diseases can be very effective. Organic growers use natural insect controls, along with natural controls such as Neem oil to deter insects (check this website to look for predatory insects that attack insects which damage fruit and trees: http://www.nysaes.cornell.edu/ent/biocontrol). For deterring fungi, mildew and molds which can greatly plague fruit trees, organic growers use products like Advanced Nutrients Protector and Scorpion Juice. These products do not create a toxic residue on fruit, and are also harmless to the environment. The good news for those who wish to eat healthy fruits grown at home is that it is indeed possible to create a home orchard that produces fruit safely and economically. We have not discussed the use of artificial lighting, containers and other methods that can create fresh fruit year round, but these methods are available to those who wish to go beyond reliance on seasons, sun, and climate for production of fruit using traditional methods. Growing in containers is often used for dwarf fruit trees and situations where the climate is too harsh to plant fruit trees and shrubs in the ground. Containers can be moved around, placed in greenhouses and otherwise situated to protect, increase growth, and give maximum exposure to sunlight and other desirable growth factors. Some container growers are using hydroponic methods to grow fruit trees. This involves using sterile root zone media that holds hydroponic nutrients and other additives that customize the root zone for maximum growth and yield. Mature trees grow to 20 ft. Two varieties are needed for best fruit set. Fruit production expected during 3rd year. ANNA – Low chill hours apple, developed in Israel. Remarkable fruit for mild-winter climates in So. California, So. Arizona. Heavy crops of sweet, crisp, flavorful apples even in low desert. Keeps 2 mos. in refrigerator. Self-fruitful or pollinated by Dorsett Golden or Einshemer. Trees are vigorous and relatively disease free. Fruit is crisp with excellent flavor and 30-50% red blush over green. Ripens late June. Dorsett Golden – Low chill apple. Excellent pollinator for Anna. Heavy producer. High quality, golden fruit. Fruit is sweet, crisp, and has a mildly sprite flavor. Ripens late June. Ein Shemer – Low chill apple. Self-pollinating. Good pollinator for Anna. Crisp, tart, good quality flesh. A low chilling selection from Israel. Bears at young age. Very productive. Ripens early June. Gala – Mid chill apple. Red striping gives golden skin a red-orange color. Crisp, aromatic flesh with touch of tartness. Excellent quality fruit that stores well. Ripens mid-summer to early fall. Granny Smith – Low chill variety from Australia. Self-pollinating. Large green fruit with glossy smooth skin. Excellent quality tart-sweet, all-purpose apple. Ripens early fall. Mollys Delicious – Mid chill, excellent quality red apple. Large fruit has light yellow ground color and bright red blush. Sweet taste is excellent for fresh eating or juice. Vigorous tree. Ripens mid-late July. Red Delicious – Requires high chilling. Favorite for generations. One of the better-known apple varieties. Creamy-white, sweet flesh with bright red skin. Plant in northern areas only. Yellow Or Golden Delicious – Mid-chilling. Parent of many low-chilling apple varieties. Large, golden fruit ripens late summer. Aromatic white flesh with mild, sweet and distinctive flavor. Self-fertile and good pollinator. Arkansas Black Apple – Large, late season. Dark red skin, high quality even where summer nights are warm. For dessert and cooking. Keeps many months. 800 hours. Partly self-fruitful. Braeburn Apple – New, from New Zealand. Superb late season fruit: very crisp and tangy, more flavorful than Granny Smith. Excellent keeper. Green with dark red blush. October-November harvest. 700 hours (est.). Self-fruitful. Bramley’s Seedling Apple – England’s favorite cooking apple. Large in size, with very tart, creamy yellow flesh that makes highly flavored pies and sauce. Also good for cider. First-picked fruits are mostly green, riper fruit greenish-yellow with uneven reddish or brownish stripes to brownish orange with little or no green. Fully ripened fruit is firm, juicy, less tart and suited to fresh use. Very high in vitamin C. Mid-season harvest, about with Golden Delicious. Keeps two months. Spreading tree is heavy-bearing and disease resistant. Originated in England in the early 1800s. Estimated chilling requirement 800-1000 hours. Sterile pollen, pollenizer required. Chehalis Apple – Highly scab-resistant variety discovered near Chehalis, Washington in 1937. Large fruit, resembling Golden Delicious. Greenish-yellow to yellow skin, sometimes blushed pink. Cream-colored flesh is crisper than Golden Delicious, the shape more elongated. Sweet, subacid, mild flavor. Used fresh and for baking. Early harvest, just before McIntosh. Estimated chilling requirement 800-1000 hours. Self-fruitful. Cortland Apple – Large red apple derived from McIntosh. Long-time favorite in eastern U.S. for fresh eating, cooking and cider. Sweet-tart, flavorful, non-browning white flesh. Early harvest, a few days after McIntosh. Precocious, productive tree, hardy to -40 degrees Fahrenheit. 1000 hours. Self-fruitful. Elstar Apple – Fine quality, all-purpose apple originating in Holland about 1955. Similar to Jonagold, but a better keeper. Ancestry includes Golden Delicious and Cox Orange Pippin. Medium to large size, round to conic shape, with yellow skin mostly striped with light red or reddish-orange. Occasional russeting around stem. Firm, crisp, creamy white flesh with outstanding flavor. Best quality in cool summer climates. Fruit may be tree-ripened, or ripened in storage. Ripens early, just ahead of Gala. Tree begins bearing at young age. Estimated chilling requirement 800-1000 hours. Pollenizer required, a mid-season or late-blooming variety such as Gala, Fuji, Granny Smith, or Melrose. Empire Apple – Sweet and juicy, sprightly flavor, a cross of McIntosh and Red Delicious. McIntosh-type apple for hot summer climates. Heavy bearing tree. Early fall harvest. Good pollenizer for Mutsu, Gravenstein, Winesap, Jonagold. 800 hours. Self-fruitful. Fuji Apple – Recent introduction from Japan that quickly became California’s favorite apple. Sweet, very crisp and flavorful, excellent keeper. Dull reddish-orange skin, sometimes russeted. Ripe mid-September. Excellent pollenizer for other apple varieties. Low chilling requirement – less than 500 hours. Self-fruitful. Gala Apple – (Original Gala) Wonderful dessert apple from New Zealand. Crisp, nice blend of sweetness and tartness, rich flavor. Skin reddish-orange over yellow. Early harvest, 2-3 weeks before Red Delicious. Good pollenizer for other varieties. Adapted to cold and warm-winter climates. Chilling requirement apparently less than 500 hours. Self-fruitful. Golden Delicious Apple – Long-time favorite for its sweetness and flavor. Reliable producer, adapted to many climates. Pollenizer for Red Delicious. Mid-season harvest (September in Central Calif.). 700 hours. Self-fruitful. Golden Russet Apple – One of the great family orchard apples of 19th century America. Crisp, aromatic, subacid, creamy yellow flesh with great flavor and legendary sugary juice. Medium size. Used fresh and for cider, drying and cooking. Ripens about with Spitzenburg: late September/early October in Central California. Ripe fruit hangs on the tree until frost; fruit stored properly keeps til April. Skin partly to almost completely russeted, varying from grayish-green or greenish-yellow to an attractive golden brown with orange highlights. Winter hardy, vigorous tree, bears mostly on the tips of branches. Good disease resistance. Apparently originated in New York as a seedling of English Russet sometime in the 1700s. Estimated chilling requirement 800-1000 hours. Partly self-fruitful, biggest crops with cross-pollination. Gordon Apple – Popular variety for Southern Calif. Low chilling requirement, about 400 hours. Red over green skin, good quality. For fresh use and cooking. Self-fruitful. Granny Smith Apple – From New Zealand. Large, late, green, all-purpose. Crisp, tart, excellent keeper. Requires long summer. Thrives in hot climates. 600 hours. Prolonged bloom: good pollenizer for other apples. Self-fruitful. Gravenstein Apple – (Green Gravenstein) Famous for sauce and baking, also used fresh. Crisp, juicy, flavorful, tart. Early bloom, early harvest. 700 hours. Pollen-sterile, pollenizer required: Empire, Fuji, Gala, Red Delicious. Haralson Apple – Extremely winter hardy tree, often begins bearing in second year. Medium-sized fruit is red-striped to solid red. Firm, crisp and juicy with a mild, slightly tart flavor. Used fresh and for cider, especially suitable for baking. Early harvest, between McIntosh and Jonathan. Excellent keeper: retains its quality for 4-6 months. Vigorous, heavy-bearing tree. Developed in Minnesota, introduced in 1923. 1,000 hours. Self-fruitful. Jonagold Apple – Superb flavor – connoisseurs’ choice. A cross of Jonathan and Golden Delicious. Yellow with red-orange blush. Crisp, juicy, subacid, all-purpose. 7-800 hours. Pollinated by Fuji, Gala, Granny Smith or Red Delicious, but not Golden Delicious. Mutsu (Crispin) Apple – A favorite of connoisseurs: very large, crisp and flavorful. Late September/October harvest. Pick when green or wait until partly yellow. Large, vigorous tree resists powdery mildew. 600 hours. Pollen sterile – pollinated by Red Delicious, Granny Smith, Fuji, Gala. Pink Lady Apple – (Cripps Pink) New hot climate apple from Western Australia. Very crisp, sweet-tart, distinct flavor, good keeper. Skin reddish-pink over green when ripe. White flesh resists browning. Harvest begins late October in Central CA, about three weeks after Fuji. Self-fruitful. 4-500 hours. Pink Pearl Apple – Unusual pink-fleshed, highly aromatic fruit. Medium size, cream and pale green skin, sometimes blushed red. Tart to sweet-tart, depending on time of picking. Early fall harvest. Good keeper. Makes colorful, tasty applesauce. Early, profuse, pink blossoms in spring. 600 hours. Pollenizer required. Red Delicious Apple – (Bisbee Spur) Sweet, crisp, flavorful – perhaps the best Red Delicious. Early fall. Small, compact tree. Good pollenizer for most other apples. 700 hours. Pollinated by Liberty, Granny Smith, Golden Delicious, Fuji, Gala. Red Delicious Bisbee Spur Apple – Sweet, crisp, flavorful – perhaps the best Red Delicious. Early fall. Small, compact tree. Good pollenizer for most other apples. 700 hours. Pollinated by Fuji, Gala, Granny Smith, or Golden Delicious. RED FUJI APPLE Redder-skinned bud sport of Fuji. Sweet, very crisp and flavorful, excellent keeper. Ripe September-October in Central Calif. Excellent pollenizer for other apple varieties. Self-fruitful. Rome Beauty Apple – Late blooming, a good choice where hard freezes in late spring are common. Large, round, red, used primarily for cooking. Heavy bearing. Late harvest. 1000 hours. Self-fruitful. Sierra Beauty Apple – Favorite late apple in No. Calif. Yellow with red blush, rich sprightly flavor, moderately sweet. Excellent fresh or cooked. Good keeper. 7-800 hours. Self-fruitful. Spitzenburg Apple – Old variety, regarded by some connoisseurs as the very best dessert apple. Red over yellow skin, yellowish flesh. Firm, juicy, moderately sweet, renowned flavor. Good keeper. 800 hours. Pollenizer required. White Winter Pearmain Apple – High quality, all-purpose apple – an old favorite, especially for fresh use. Widely adapted, including California’s mild-winter coastal climates. Medium to large size, round to oval shape, pale yellow skin with dull red blush. Cream-colored flesh is fine-grained, crisp, juicy and aromatic with a rich, subacid to sprightly flavor. September/October harvest, good keeper. Healthy, vigorous, spreading, heavy-bearing tree. Excellent pollinator for other apples. Believed to be the oldest known English apple, dating back to 1200 A.D. Low winter chilling requirement, about 400 hours. Self-fruitful. Yellow Newton Pippin Apple – Yellow-green, late, firm, crisp, slightly tart, superb flavor. For peak flavor and acid/sugar balance, wait to harvest til cheeks are blushed yellowish-green (late Oct./early Nov. in Central Calif.). Good keeper. Famous for cooking, excellent fresh or dried. Vigorous tree. 700 hours. Self-fruitful. York Apple – (York Imperial) One of the very best apples for keeping: in a cool location, it holds its flavor til April or May. Fine quality for dessert use, excellent for baking and cider. Greenish-yellow skin with light red blush and stripes to nearly fully red, occasionally russeted at either end. Very firm, coarse, yellow flesh is crisp, juicy and slightly aromatic, with a semi-sweet flavor. Medium to large size, many fruits having a characteristic lopsided, rectangular shape. Late harvest, with or just ahead of Yellow Newton Pippin and Granny Smith. Fairly large tree is moderately winter hardy, late-blooming, disease-resistant. At its best on heavier clay soils. Discovered near York, Pennsylvania; first propagated prior to 1830. Estimated chilling requirement 800-1000 hours. Self-fruitful. Transcendent Crabapple – Yellow skin with pink or red blush to almost entirely red. Up to 2 inches wide. Creamy yellow flesh is crisp, juicy and flavorful. Late summer harvest. Medium-sized tree, consistent crops. 7-800 hours. Self-fruitful. Plant figs on 15 ft. diameters apart from each other. Plant on south side of buildings for winter protection. Figs are a warm-temperature fruit, but under optimum conditions will withstand temperatures down to 10 degrees F. Little maintenance required. All varieties are self-fruitful. Brown Turkey – Developed from Celeste. Very prolific, bears on young wood. Fruit is medium in size, bronze skin with white flesh. Fruit good for making preserves, very sweet. Long ripening season is from mid-July through mid-September. Celeste – Large tree. Most widely planted variety in this area. Bears on two-year-old wood. Excellent fruit quality, good for fresh eating and preserves. Medium fruit is resistant to souring and splitting. Begins ripening in June and continues to produce fruit for 3 – 6 weeks. Lsu Purple – Fruit are medium in size with a glossy, purple skin. Fruit may be produced on young trees one-two years old. Variety is considered ever bearing with potentially three crops a year, but heavy crop peaks in early July. Tree is vigorous, upright growing, and has shown above average cold tolerance. Mayhaw – Native tree. Self-fertile. Small, red berries ripen in late April-May. Berries are excellent for making jellies. Mayhaw jelly claimed by many to be one of the best to be made. Profuse bloom of white flowers in early spring and attractive tree make it excellent for ornamental uses also. Plant on 15 ft. spacing. Black Jack Fig – Large, purplish-brown figs with sweet, juicy, strawberry-red flesh. Harvest August to October in Central California. Naturally small (semi-dwarf) tree. 100 hours. Self-fruitful. Black Mission Fig – The favorite. Purplish-black skin, strawberry- colored flesh, rich flavor. Heavy bearing, long-lived, large tree. Coast or inland. Fresh/dry/can. 100 hours. Self-fruitful. Celestial Fig – Purplish-brown skin, pink flesh. Widely adapted. Two crops per year – early summer and late summer to early fall. Prune to any shape. 100 hours. Self-fruitful. Conadria Fig – Light greenish-yellow skin, pink flesh. Not as sweet as Kadota, but resists spoilage. Fresh/dried. Very vigorous, long-lived tree. Heavy crops coast or inland. 100 hours. Self-fruitful. Flanders Fig – Medium sized long necked fruit with violet stripes and scattered white specks; amber to white meat with light strawberry pulp. Rich flavor, split resistant, highly productive. 100 hours. Self-fruitful. Improved Brown Turkey Fig – Large, brown skin, pink flesh. Sweet, rich flavor, used fresh. Widely adapted – coast or inland climate. Small tree, prune to any shape. 100 hours. Self-fruitful. Janice Seed-less Kadota Fig – New `white’ fig. Large, sweet, delicious, light greenish-yellow fruit with practically no seeds. Prolonged harvest, August through November at Fremont, Calif. Suited to coastal and inland climates. Prune to any shape. 100 hours. Self-fruitful. Kadota Fig – Large, light greenish-yellow ‘white’ skin, amber flesh. Long-lived, vigorous. Prune to any shape. Very sweet fruit needs hot weather to ripen. Fresh/dry/can. 100 hours. Self-fruitful. King Fig (Desert King) – Light green ‘white’ skin, strawberry colored pulp. Rich flavor, excellent fresh-eating quality. 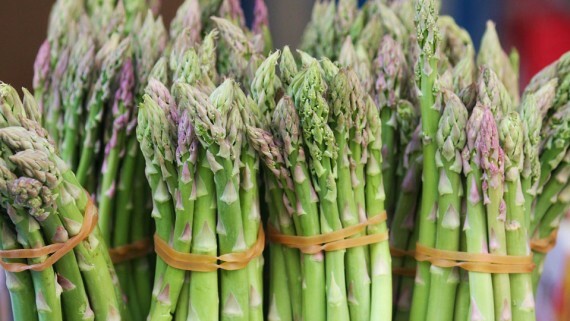 Large breba (spring) crop. Later crop is light in hot climates, heavier in coastal climates. Prune only lightly, occasionally. (Heavy winter pruning removes breba crop.) 100 hours. Self-fruitful. Osborne Prolific Fig – Large fruit with very attractive purplish-brown skin, amber pulp. Especially pleasing flavor. Long-time favorite in cool coastal areas, excellent inland as well. Prune to any shape. 100 hours. Self-fruitful. Panache (Tiger) Fig – Especially fine flavor! Small to medium sized fruit, green in color with yellow “tiger” stripes. Strawberry pulp is blood-red in color. 100 hours. Self-fruitful. White Genoa Fig – Old variety, a favorite in cool coastal areas -also excellent inland. Greenish-yellow skin, amber flesh, distinctive flavor. Prune to any shape. 100 hours. Self-fruitful. Ask local ag experts which varieties of peaches are best suited to your area. Plant different varieties to extend harvest season. Most varieties are self-fruitful. Plant on 25 foot centers. Belle Of Georgia – Requires 850 chilling hours. An old favorite white-fleshed peach. Partial red-blushed skin. Fruit is soft and juicy. Good for fresh eating, low-acid makes flavor very sweet. Freestone. Ripens second week in July. Elberta – Requires 850 chilling hours. Best-known yellow canning peach. Freestone. 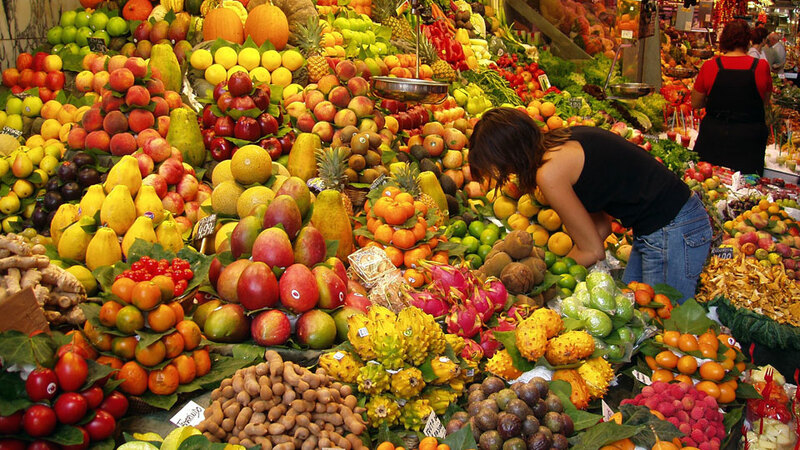 Fruit is large, attractive, and good quality. Rich, sweet flavor. Heavy producer. Ripens third week in July. Flordaking – Requires 450 chilling hours. Very early, ripening third week in May. Large yellow-fleshed clingstone fruit. Early bearer and vigorous grower. Hale Haven – Requires 850 chilling hours. Large freestone fruit of firm, but juicy yellow flesh. Exceptional quality. High yielder. Ripens early July. Harvester – Requires 750 chilling hours. Large, freestone fruit of excellent quality. Red skin over yellow flesh. Ripens third week of June. Hawthorne – Requires 550 chilling hours. Produces heavy crop of large freestone fruit of good quality, firmness, and texture. Yellow flesh with heavy surface blush. Stores well. Ripens last week of June. La Feliciana – Requires 550 chilling hours. Freestone, 2 1/2 – 2 3/4 inch fruit. Heavy producer. Very popular, best-known LSU variety. Ripens first week in July. La Festival – Requires 450 chilling hours. Freestone, large fruit with yellow flesh flecked with red. Trees are vigorous and productive. Ripens third week in June. La Peche – Requires 450 chilling hours. LSU variety. Heavy producer of medium-large semi-freestone fruit. Flesh is yellow and red. Trees are vigorous and productive. Ripens third week in June. Sam Houston – Requires 500 chilling hours. Medium size. Freestone with small pit. Yellow fresh is firm with mild flavor. Distinctive taste. Ripens mid-late June. Arctic Supreme White Peach – Two-time taste test winner. Large, white flesh, nearly freestone when fully ripe. Red over cream colored skin. Sweet and tangy, fine delicate flavor, firm texture. Peak quality reached a short while after picking. Harvest late July/early August in Central Calif. 700 hours. Self-fruitful. Babcock White Peach – Long-time favorite white-fleshed freestone. Sweet and juicy, aromatic, low in acid. High-scoring in taste tests. Ripens mid-July in Central Calif. Widely adapted (low chill requirement, yet not early blooming). 250-300 hours. Self-fruitful. CARNIVAL PEACH Very late season yellow freestone. Large red-skinned fruit ripens late September to early October in central California. Vigorous, productive tree. Estimated chilling requirement 5-600 hours. Self-fruitful. Compact Flavorette Genetic Semi-dwarf Peach – Naturally small tree, to about 10 ft. high. Delicious freestone fruit: red-streaked orange flesh with rich, tangy flavor – high-scoring in taste tests. Late July/early August in Central Calif. Ideal for home orchard. 6-700 hours. Self-fruitful. Donut White Peach – Also called Saucer or Peento Peach. Unique white-fleshed fruit with a sunken center (shaped like a doughnut). Sweet, with a mild flavor described by some as almond-like. Ripens late June/early July in Central Calif. Estimated chilling requirement 500 hours. Self-fruitful. Eldorado Miniature Peach – Well-known Jackson & Perkins variety. Exceptionally high quality, richly-flavored fruit. Yellow freestone, attractive red-blushed skin. Harvest early to mid-June. 4-5 ft. tree. 500 hours. Self-fruitful. Elberta Peach – Famous yellow freestone. Classic, rich, peach flavor: high-scoring in taste tests. Use fresh, canned, cooked. Ripe late July/early August in Central Calif., up to 3-4 weeks later in colder climates. 800 hours. Self- fruitful. Elegant Lady Peach – Well-known fresh market peach. Large, firm, yellow freestone(bright red at pit). Red over yellow skin. High fruit tasting scores: excellent flavor, balanced sugar and acid. Harvest late July in Central California. Introduced about 1979. Chilling requirement 700-800 hours. Self-fruitful. Fairtime Peach – Highly esteemed late season peach – one of the last to ripen(about six weeks after Elberta), and one of the best. Large, yellow freestone with distinctive, smooth, rich, peach flavor. Attractive yellow skin with bright red blush where exposed to sun. Used fresh and for freezing. Mid-September in Central Calif. Early bloom. 500 hours. Self-fruitful. Fay (Late) Elberta Peach – Popular yellow freestone: juicy, moderately sweet, flavorful. Fresh/can/freeze/dry. Ripens 1-2 days later than Elberta in Central California (August 1st. Blooms earlier. 700 hours. Self-fruitful. Flordaprince Peach – From Florida, successfully grown in Southern California/Arizona. Larger fruit than Desert Gold, more tolerant of desert heat, better flavor. Semi-freestone when soft-ripe. Ripens early May in warm areas. 150 hours. Self-fruitful. Gold Dust Peach – Best early season yellow peach: very high scores for flavor and overall appeal in Dave Wilson Nursery blind taste tests. Semi-freestone ripens mid to late June in Central Calif., 2-3 weeks ahead of Redhaven. All-purpose, superb for eating fresh. Not an early bloomer. 550 hours. Self-fruitful. Halford Cling Peach – Large yellow canning cling, the leading commercial variety. Very good quality. Productive. Early September in Central California. 800 hours. Self-fruitful. Honey Babe Miniature Peach – Sweet, yellow freestone, rich peach flavor. Heavy bearing 5 ft. tree. Early to mid-July in Central Calif. Excellent choice for home orchard. 500 hours. Self-fruitful. Indian Blood Cling Peach – Large, late season canning peach. Red- skinned, red flesh, rich flavor. Blooms late, sets heavy crops. 800 hours. Self-fruitful. Indian Free Peach – Taste test winner, and one of the all-time highest rated fruits at Dave Wilson Nursery fruit tastings. large freestone, firm crimson and cream colored flesh. Tart until fully ripe, then highly aromatic with a rich, distinctive flavor. Highly resistant to peach leaf curl. Late season. 700 hours. Another nectarine or peach needed to pollinate. J.H. Hale Peach – Old variety, still one of the best. Very large, firm, superb flavor. Fresh/canned. Ripe August 1st in Central Calif. Excellent frost hardiness. 800 hours. Another nectarine or peach needed to pollinate. 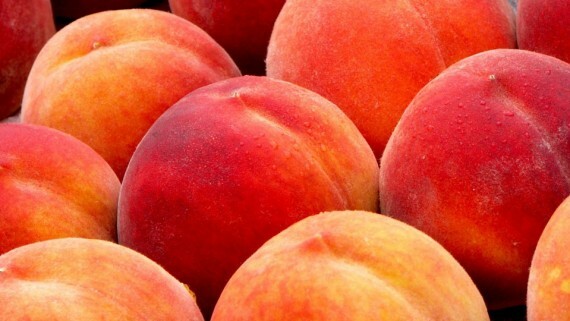 June Pride Peach – Intensely flavored, highly colored yellow freestone. Perhaps the best-flavored peach for its season – July 1st in Central Calif. Excellent early peach for home orchards. 6-700 hours. Self-fruitful. July (Kim) Elberta Peach – Also called Early Elberta. Reliable heavy crops. Juicy, sweet, very flavorful yellow freestone fruit for canning, freezing, or fresh use. 500 hours. Self-fruitful. Nectar White Peach – (Original Nectar) One of the finest white peaches. Medium to large fruit with dark pink blush over a beautiful cream to pale green background. White freestone flesh, tinged with red, is sweet with exceptional flavor and aroma. Harvest three weeks before Elberta. Originated in Bakersfield, Calif., introduced in 1935. 800 hours. Self-fruitful. O’henry Peach – Popular fresh market yellow freestone now available for home planting. Large, firm, full red skin, superb flavor. Ripens early to mid-August in Central Calif. Good for freezing. Strong, vigorous, heavy bearing tree. 750 hours. Self-fruitful. Q-1-8 WHITE PEACH leaf curl-resistant variety, tested at the WSU research station at Mt. Vernon, Washington. In the Dave Wilson Nursery orchards, the white-fleshed, semi-freestone fruit is sweet and juicy like Babcock, with a more sprightly flavor. Harvest mid to late July in Central Calif. Showy blossoms. 7-800 hours. Self-fruitful. Red Baron Peach – Flowering/fruiting. Large, juicy, firm, richly flavored yellow freestone fruit. Showy double red blossoms. Mid-July. Long-time favorite in Southern California. Low chilling requirement, 250-300 hours. Self-fruitful. Redhaven Peach – World’s most widely planted peach. High quality yellow freestone. Ripens early July in Central California. Frost hardy. Fresh/freeze. 800 hours. Self-fruitful. Redskin Elberta Peach – Cross of Redhaven and Elberta. Excellent quality all-purpose yellow freestone. Frost hardy. Ripens August 1st in Central Calif. Also called Redskin. 850 hours. Self-fruitful. Rio Oso Gem Peach – Favorite late yellow freestone. Large, sweet, rich flavor, like J.H. Hale. Fresh/freeze. Small tree Showy bloom. Mid-August in Central California. 800 hours. Self-fruitful. Saturn Peach – Flowering/fruiting. Spectacular, large, dark-pink double blossoms. Yellow freeestone fruit is large, juicy, sweet, low in acid & has a fine flavor. Ripens mid-July in central California. Long-time favorite in southern California. Low chilling requirement: 250 – 300 hours. Self-fruitful. Summerset Peach – Fine late season yellow freestone, ripens approximately September 1st in Central California. Large, sweet and flavorful. Excellent for canning, freezing or fresh use. 700 hours. Self-fruitful. Suncrest Peach – Large, very firm, fine-flavored, yellow freestone. Bright red skin over yellow. Suncrest is the peach immortalized by the book Epitaph for a Peach: four season on my family farm, by David Mas Masumoto(1995). Tree-ripe harvest late July in Central California. Frost hardy blossoms, consistent producer. Originated in Fresno, Calif. Introduced in 1959. 700 hours. Self-pollinating. SWEET BAGEL PEACH Flat “Donut” shaped peach with yellow flesh and classic peach flavor. Has large fruit and sets heavily in central California. Moderate chill requirement. 500-700 hours. Sweet Gem Peach – Dark red-skinned, firm, early season fruit. Non-acidic and sweet, even while still hard. Extremely sweet and flavorful when soft-ripe. Harvest mid-June to early July in Central Calif. 6-700 hours. Self-fruitful. TRA-ZEE PEACH Delicious late season peach. Harvest mid August to early September in Central Calif. Firm, yellow freestone with very attractive dark red skin and excellent flavor. Highly recommended. 700 hours. Self-fruitful. Tri -lite Peach X Plum – A popular variety at DWN fruit tastings. This white-fleshed peach/plum hybrid can be eaten firm. It has a mild, classic flavor with a wonderful plum aftertaste that makes this a unique treat. What Are The Absolute BEST Grow Nutrients For Beginners?